Quantum Dots | Genesis Nanotechnology, Inc.
Quantum computing is heralded as the next revolution in terms of global computing. Google, Intel and IBM are just some of the big names investing millions currently in the field of quantum computing which will enable faster, more efficient computing required to power the requirements of our future computing needs. Now a researcher and his team at Tyndall National Institute in Cork have made a ‘quantum leap’ by developing a technical step that could enable the use of quantum computers sooner than expected. Conventional digital computing uses ‘on-off’ switches, but quantum computing looks to harness quantum state of matters – such as entangled photons of light or multiple states of atoms – to encode information. In theory, this can lead to much faster and more powerful computer processing, but the technology to underpin quantum computing is currently difficult to develop at scale. Researchers at Tyndall have taken a step forward by making quantum dot light-emitting diodes (LEDs) that can produce entangled photons (whose actions are linked), theoretically enabling their use to encode information in quantum computing. This is not the first time that LEDs have been made that can produce entangled photons, but the methods and materials described in the new paper (Nature Photonics, “Selective carrier injection into patterned arrays of pyramidal quantum dots for entangled photon light-emitting diodes”) have important implications for the future of quantum technologies, explains researcher Dr Emanuele Pelucchi, Head of Epitaxy and Physics of Nanostructures and a member of the Science Foundation Ireland-funded Irish Photonic Integration Centre (IPIC) at Tyndall National Institute in Cork. “The new development here is that we have engineered a scalable array of electrically driven quantum dots using easily-sourced materials and conventional semiconductor fabrication technologies, and our method allows you to direct the position of these sources of entangled photons,” he says. The Tyndall technology uses nanotechnology to electrify arrays of the pyramid-shaped quantum dots so they produce entangled photons. “We exploit intrinsic nanoscale properties of the whole “pyramidal” structure, in particular, an engineered self-assembled vertical quantum wire, which selectively injects current into the vicinity of a quantum dot,” explains Dr Pelucchi. “It is exciting to see how research at Tyndall continues to break new ground, particularly in relation to this development in quantum computing. The significant breakthrough by Dr Pelucchi advances our understanding of how to harness the opportunity and power of quantum computing and undoubtedly accelerates progress in this field internationally. Photonics innovations by the IPIC team at Tyndall are being commercialized across a number sectors and as a result, we are directly driving global innovation through our investment, talent and research in this area,” said Dr Kieran Drain, CEO at Tyndall National Institute. The specks they saw were bits of graphene or, more precisely, oxidized nanodomains of graphene extracted via chemical treatment of carbon fiber. “That was a complete surprise,” Gao said. “We call them quantum dots, but they’re two-dimensional, so what we really have here are graphene quantum discs.” Gao said other techniques are expensive and take weeks to make small batches of graphene quantum dots. “Our starting material is cheap, commercially available carbon fiber. In a one-step treatment, we get a large amount of quantum dots. I think that’s the biggest advantage of our work,” she said. Further experimentation revealed interesting bits of information: The size of the dots, and thus their photoluminescent properties, could be controlled through processing at relatively low temperatures, from 80 to 120 degrees Celsius. “At 120, 100 and 80 degrees, we got blue, green and yellow luminescing dots,” she said. Their luminescent properties give graphene quantum dots potential for imaging, protein analysis, cell tracking and other biomedical applications, Gao said. Tests at Houston’s MD Anderson Cancer Center and Baylor College of Medicine on two human breast cancer lines showed the dots easily found their way into the cells’ cytoplasm and did not interfere with their proliferation. Ciphers and invisible ink – many of us experimented with these when we were children. A team of Chinese scientists has now developed a clever, high-tech version of “invisible ink”. As reported in the journal Angewandte Chemie, the ink is based on carbon nitride quantum dots. Information written with this ink is not visible under ambient or UV light; however, it can be seen with a fluorescence microplate reader. The writing can be further encrypted or decrypted by quenching or recovering the fluorescence with different reagents. Fluorescing security inks are primarily used to ensure the authenticity of products or documents, such as certificates, stock certificates, transport documents, currency notes, or identity cards. Counterfeits may cost affected companies lost profits, and the poor quality of the false products may damage their reputations. In the case of sensitive products like pharmaceuticals and parts for airplanes and cars, human lives and health may be endangered. Counterfeiters have discovered how to imitate UV tags but it is significantly harder to copy security inks that are invisible under UV light. Researchers working with Xinchen Wang and Liangqia Guo at Fuzhou University have now introduced an inexpensive “invisible” ink that increases the security of encoded data while also making it possible to encrypt and decrypt secure information. 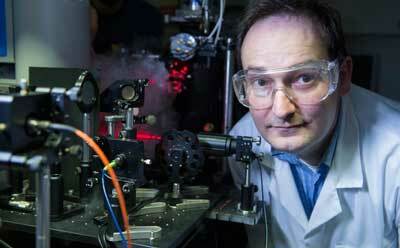 The new ink is based on water-soluble quantum dots, nanoscopic “heaps” of a semiconducting material. Quantum dots have special optoelectronic properties that can be controlled by changing the size of the dots. The scientists used quantum dots made from graphitic carbon nitride. This material consists of ring systems made of carbon and nitrogen atoms linked into two-dimensional molecular layers. The structure is similar to that of graphite (or graphene), one of the forms of pure carbon, but also has semiconductor properties. Information written with this new ink is invisible under ambient and UV light because it is almost transparent in the visible light range and emits fluorescence with a peak in the UV range. The writing only becomes visible under a microplate reader like those used in biological fluorescence tests. In addition, the writing can be further encrypted and decrypted: treatment with oxalic acid renders it invisible to the microplate reader. Treatment with sodium bicarbonate reverses this process, making the writing visible to the reader once more. Iron-dotted boron nitride nanotubes, made in Yoke Khin Yaps’ lab at Michigan Tech, could make for better wearable tech because of their flexibility and electronic behaviors. The road to more versatile wearable technology is dotted with iron. 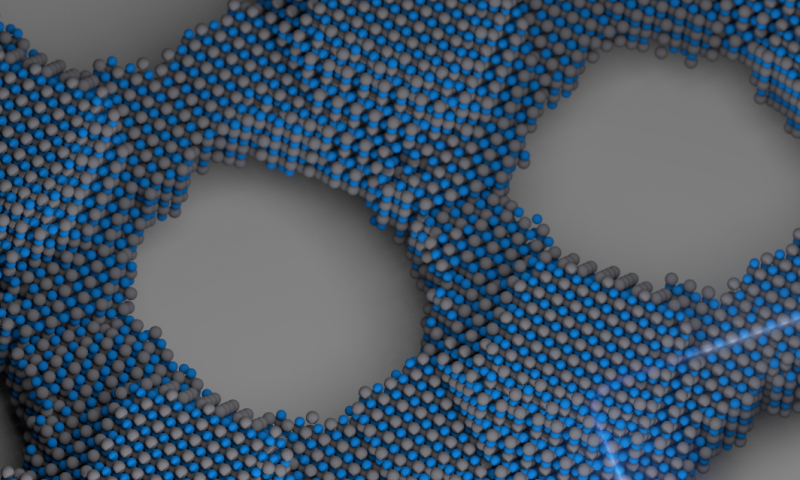 Specifically, quantum dots of iron arranged on boron nitride nanotubes (BNNTs). The new material is the subject of a studypublished in Scientific Reports in February, led by Yoke Khin Yap, a professor of physics at Michigan Technological University. Even with all the promise offered by additive manufacturing (AM), some people are still wary of the potential pitfalls exposed by the technology. Leaving the notion of 3D printed guns, hearts and electronics aside, there are very real concerns about how intellectual property (IP) will fare in a digital manufacturing world, or how any single company can protect sales of 3D printed objects. Piracy is often seen as only a 3D scanner and printer away. A new start-up Nano-materials company may have the solution to some of these concerns. The company is in the business of manufacturing, among other things, quantum dots. These tiny structures are constructed from semiconductor Nano-materials, and can be embedded within 3D printed objects. A partnership with the Institute for Critical Technology and Applied Science and the Design, Research, and Education for Additive Manufacturing Systems (DREAMS) Laboratory at Virginia Tech has resulted in a method of using quantum dots to act as a sort of fingerprint for objects built using AM. The quantum dots work to foil counterfeiters by creating a unique signature for each item that is only known to the company producing that item. This will allow for rapid recognition of counterfeit items without requiring destructive testing methods. Additionally, the company offers a number of semiconductor Nano-materials that further increase security. If you are familiar with computing, the addition of unique materials improves security strength in a similar way as moving from 128-bit to 256-bit encryption, according to the company. With the recent boom in medical AM, both for rapid prototyping and end-use, this type of security can offer companies some assurance that they’ll see a return on investment for all the hard work put in to designing new devices. The use of quantum dots should also reassure other manufacturers who are on the fence about the use of AM that their patents will be upheld by more than a piece of paper and a handshake. As 3D Printing Comes of Age – How will 3D Printing (Additive Manufacturing or ‘AM’) Combat Counterfeiting Products? The specter of counterfeit products is always a concern for any company that relies on other facilities to actually manufacture and assemble their products. From fake Rolex watches to fake iPhones to fake Louis Vuitton purses, large companies often spend millions to protect their intellectual property from criminals who copy and sell fake products to often unsuspecting consumers. While it can be easy to be anti-corporate and turn a blind eye to this kind of theft, especially when the companies are large and extremely profitable, their concern goes far beyond the potential loss of profits. The fact is, most counterfeit products are vastly inferior to the real thing, and if a consumer doesn’t know that they are purchasing a fake then the company not only has a lost sale, but their reputation will take a hit based on something that they didn’t even produce. Even as 3D printing continues to grow into a valid and profitable alternative manufacturing method to injection molding or large-scale mass production, there are still companies that see the threat of counterfeiting as a reason to stall the adoption of 3D printing technology. Realistically there is not much that can be done about pirated 3D models and individuals using home 3D printers to make fake products. Combating individual piracy has been woefully ineffective for the entertainment industry, and probably only encouraged more users to download electronic files illegally. It stands to reason that going after individual pirates will work just as well if the 3D printing industry makes an attempt to over-regulate and control the flow of 3D printable files. DRM on 3D printable files is probably not going to be an effective deterrent. Many of the solutions that are being floated as counter-counterfeiting measures don’t really seem especially feasible or sustainable. Adding DRM (digital rights management) or unlock code requirements to 3D files may slow down some users, but just as with DRM efforts on movies and video games, if someone can put a lock on something, someone can take that same lock off and teach others how to do it as well. These efforts may work in the short term, as the pool of users who are capable of breaking DRM on 3D printable files is smaller, and there isn’t really an outlet to disperse those illegal files yet. But as the industry grows it is going to be harder and harder for companies to control their intellectual property using these methods. I’m not really sure that there is much to be done on this end of the industry. Besides, there is an even greater counterfeiting problem brewing on the manufacturing side of the industry and it is far more important than individual piracy ever could be. As with fake mass-produced consumer goods, mass-produced industrial parts are also counterfeited quite frequently. It may be more interesting to talk about fake purses, but a greater threat is products like fake screws, bolts, fittings and individual components. Many of the parts that are used to build our homes, businesses, vehicles and personal electronics use mass-produced components that manufacturers simply purchase in extremely large quantities. And all of those parts are held to very strict manufacturing guidelines that dictate how they can be used, what their maximum stress tolerances are and how they can be expected to perform. When these types of components are forged, they are rarely made with the same quality of materials and often don’t even come close to performing as required. If these fake parts find their way unknowingly into the hands of manufacturers, who design products with these components’ manufacturing guidelines in mind, then the results could be catastrophic. There have been instances of airplanes and automobiles that have crashed due to the failure of lower quality, counterfeit parts. Buildings and homes are also at risk due to poor quality and counterfeited construction materials being used. It may seem odd, but cheaply made products that do not pass strict regulations are a huge business and lives can be lost to it. 3D printed Nike shoes with embedded InfraStructs. With 3D printed components becoming more common, and eventually expected to be extremely common, counterfeit parts will pose a real risk. Using DRM, even if it was effective on a small scale, to prevent machines from making unauthorized parts is not going to matter when these parts can simply be 3D scanned and reproduced without the need for the original 3D model. The methods that need to be developed to combat this type of industrial counterfeiting will need to work in ways that DRM never will and identify the specific physical object as authentic. There are a few different methods that are currently being proposed, with varying probabilities of success. The most likely option will be including RFID tags on 3D printed components that will identify an object as the real thing. The idea is that any part that doesn’t have an embedded RFID device in it — and they can easily be made small enough to easily be inserted inside of a 3D printed part — will automatically be identified as fake. The downside of this method is price, as the RFID tags themselves would be costly, as would the labor involved in inserting them. Testing for tags will also require specialized equipment that adds more cost to the authentication process. It is possible that a 3D printable material that would act as a tag called InfraStructs could be developed, but that would mean developing multiple materials that will be RFID reactive, which will be quite costly on the development side. Another authentication option would be chemically tagging materials that can be detected with a handheld spectrometer. There are multiple companies providing these types of materials, but the most promising is a technique developed by InfraTrac. The Maryland-based company has developed a chemical that can be discreetly added to virtually anything without altering the chemical makeup of the material. For instance, parts can be 3D printed with a small subsurface “fingerprint” hidden in a discrete location. That mark alone would be printed with the material that has been treated with the chemical, and would easily identify the part as genuine. The material could also be printed as a single layer of the print with no mark, and no risk of altering the integrity of the part. Of course again this comes with it the need for specialized equipment in the form of the spectrometer and an actual machine that can 3D print with the standard material and the second, tagged material. One thing is very clear, there is a desire for additive manufacturing to be developed as an alternative to other mass production methods. That means the companies looking to use 3D printing to manufacture parts, and the 3D printing industry itself, are going to need to address the problem sooner rather than later. Determining which of these options is the ideal solution will not be an easy choice, as they both bring with them additional costs and challenges, but doing nothing simply isn’t an option. Nanosys scientific co-founder and Director of the Lawerence Berkeley National Lab, Dr. Paul Alivisatos, takes NBC Learn on a tour of Nanosys’ Silicon Valley Quantum Dot manufacturing facility. The section on Nanosys begins at 2:16 – enjoy! ALIVISATOS: What we have here is a plastic film that contains inside of it quantum dots, very tiny, tiny crystals made out of semiconductors. It actually contains two sizes of nanoparticle – a very small size that emits a green color and a slightly larger size that emits a red color of light. ALIVISATOS: One of the things that we’ve learned about vision is that we have receptors in our eyes for green, red and blue colors. And if we want a really high quality display, we need to match the light emission from our display to the receptors in our eyes.